In his latest lesson for us all, John reveals some Grand National connections, the Heineken Cup knock-out kings, England's homes away from home, the first penalty and the longest Five Nations Championship careers. A. Several current and recent international players are devoted to the horse and some even own or part-own race-horses. Two former players come to mind in connection with Grand National successes. The winner of the 1928 race was Tipperary Tim, one of the select few to have won the race with starting odds of 100-1. This particular rank outsider famously finished the race alone after a pile-up at the Canal Turn. The horse was bred by John Ryan, one of a pair of famous brothers who played rugby for Ireland at the end of the nineteenth century. Fast forward to 1979 and the owner of that year's National winner was another ex-international, John Douglas of Scotland, who won a dozen caps in successive Tests between 1961 and 1963 and toured South Africa with the 1962 Lions. His horse, Rubstic, scored at 25-1 to become the first Scottish-trained winner of the race. Each player was a forward and each had the distinction of playing in famous winning sides at Cardiff Arms Park. Ryan and his brother Mick reputedly went after the Welsh fullback, Billy Bancroft, in 1899 and threw him into the enclosure during Ireland's 3-0 win to secure the Triple Crown. John Douglas, a No.8, took part in Scotland's 8-3 win at Cardiff in 1962 - Scotland's first in the Welsh capital since 1927. 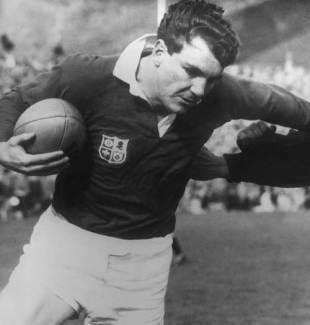 He was instrumental in his team's first try (which was Scotland's first in Cardiff since 1935), making the blind-side break that led to Ron Glasgow's score. Toulouse and Munster, who have each played a century or more of Heineken Cup games, head the list of teams that have qualified for the knock-out stages of the competition: eleven times out of a possible 14. In the first season of the competition (1995-96) there was no quarter-final stage, the four pool winners progressing straight to the semi-finals. For every subsequent tournament, however, the knock-out phases have started with the quarter-finals. Billy Bancroft landed the first penalty goal in a Test. The score came near the end of the 1893 Wales-England match, which was the first between the two countries to be staged at Cardiff Arms Park. England were leading 11-9 when Arthur Gould, the Welsh captain, directed his fullback to kick for goal. The kick was taken from far out and near touch, but Bancroft sent the ball over the crossbar for a 12-11 Welsh win that set them on the road to their first Triple Crown. Four seasons passed before a player kicked two penalty goals in a Test and it was not until after the Great War that the first hat-trick of penalty goals was scored in an international. Today, the record for most penalty goals kicked by a player in a Test stands at nine. * indicates that only the kicker's team regard the match as a Test. A. The Irish forward Tom Reid was the last man to achieve the feat. He was a Lion in 1955, playing one Test as a No.8 and another as a lock in the drawn series against the Springboks. He toured Canada with the Barbarians two years later, settled there and on September 29, 1959 appeared for Eastern Canada in the back-row against Ronnie Dawson's Lions. The visitors, in their last match of a marathon trip that took in 33 games in Australia, New Zealand and Canada, won 70-6, taking their grand total of points scored on tour past 800. The game was played in Toronto's Varsity Stadium. New Zealand's Graham Henry coached the 2001 Lions in Australia during his time with Wales and four years later oversaw the All Blacks' preparation for their series against the last Lions to tour overseas. Among those who played against the tourists in 2005 was Riki Flutey, a strong candidate for selection for the forthcoming Lions' tour to South Africa. He appeared as a replacement for Wellington in their 23-6 defeat by Brian O'Driscoll's Lions. A. A handful of England's home Tests have been staged away from Twickenham since the ground opened nearly a hundred years ago. In 1923, thirteen years after Twickenham had staged its first international match, England entertained Ireland at Leicester's Welford Road. The crowd of 20,000 was considered disappointing and the experiment of staging England internationals in the provinces was never repeated in the International Championship. Four times in the 1990s, however, the RFU deserted their headquarters to stage matches against overseas sides. While Twickenham was closed for refurbishments in 1992, England played Canada in a full-blown Test at Wembley, while five years later they went north-west to Old Trafford where a full-house saw Richard Cockerill stand up memorably to Norm Hewitt at the haka prior to England's match with the All Blacks. Huddersfield's McAlpine Stadium was the stage for England's two Rugby World Cup qualifiers against Italy and The Netherlands the year later. It's true that England went to Wembley in 1999 to play Wales in the last-ever Five Nations match, but that was strictly a "home" match for the Welsh who used the stadium for their Championship games while the Millennium Stadium was under construction. A. Two famous Irish players share this record, Tony O'Reilly and Mike Gibson. O'Reilly made his Test debut for Ireland against France in 1955. He played 26 times in the Five Nations up to 1963 and was recalled, out of the blue, to make a 27th appearance in the tournament as an eleventh-hour stand-in against England at Twickenham in 1970. His selection, incidentally, deprived Brian O'Driscoll's father Frank, the nominated threequarter substitute, of his Irish cap. Mike Gibson played his first game for Ireland in an 18-5 win at Twickenham in 1964. He was a regular on the Irish team for the next fifteen years, playing 56 times in the Five Nations up to 1979 - the appearance record for the Championship. By coincidence each player's career span was 15 years and 23 days.